Gene expression strongly depends on the rate constants of biochemical reactions, such as e.g. transcription factor + DNA. A small variation in these rates may dramatically change the gene expression. Therefore, in order to design genetic circuits having desired properties, biotechnologists have to know exactly the rates of reactions that control gene expression. In biochemistry, a standard reaction rate analysis is usually done in vitro, in a buffer of viscosity of water. 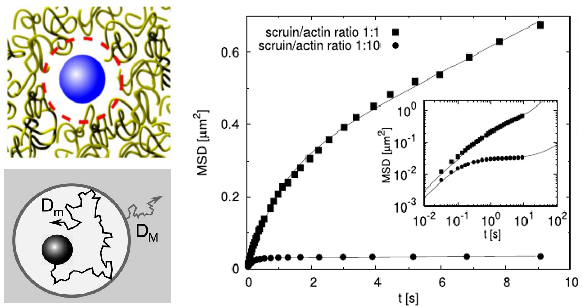 However, in vivo, in a crowded environment of high viscosity, biochemical reactions are usually limited by diffusion, and their rates may differ by several orders of magnitude from those expected based on the standard measurements. Moreover, many biochemical reactions in living cells are diffusion-limited. If the diffusion of molecules in a crowded environment differs from that expected based od in vitro experiments, then also the rates of biochemical reactions may be quite different from in vitro predictions. In this project, we studied (both theoretically and experimentally) the transition from the nanoscopic to macroscopic diffusion in a crowded environment. In particular, we studied the effect of the less crowded depletion layer around the diffusing nanoparticle. The depletion layer affects the speed of diffusion in different length scales: The motion of the nanoparticle is faster within the less crowded layer and slower on longer distances. We wanted to experimentally measure the depletion layer thickness, to understand theoretically the dependence of that thickness on the particle size and other factors. In a wider perspective, this knowledge may be important for understanding how the rates of biochemical reactions, especially those involved in gene regulation, are affected by crowding which hinders diffusion of reacting molecules. The experimental methods we used were: dynamic light scattering (DLS) and fluorescence correlation spectroscopy (FCS).